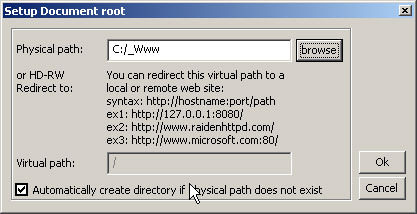 The most suitable operating system environments for running RaidenHTTPD are Windows 2000/XP/2003/Vista. If your computer is capable of running those operating systems, then you have got your way to go! However, Windows98/ME are also supported, but the stability is not guaranteed. Run all Windows Updates to ensure that your operating system is up to date. If you have another web server with PHP installed, such as APACHE, please shutdown its service first so that the RaidenHTTPD installation program can install PHP dlls succesfully. Please shutdown RaidenHTTPD service and turn off the tray icon 'RaidenAdmin' program if you are updating over the existing RaidenHTTPD installation. 2. Run RaidenHTTPD_PHP5.exe, install to drive C and finish the installation. the First-time Setup Wizard will pop up after the installation is completed. If your server IP is set to 0.0.0.0 , it will bind to all local IPs. Please make sure to enable SSL/TLS (If You have the license key). If you install the php engine by the RaidenHTTPD installer, then the php4isapi.dll (or PHP5) has already been configured. Otherwise, you need to specify its location by clicking the browse button. Now you are in the virtual host and virtual directory setup dialog. There is nothing much to change here, but, for security reason, it is recommended that you disable 'directory index'. However, if you setup IP-checking properly, then it's ok to enable it. At last, click Next to install service and start service. 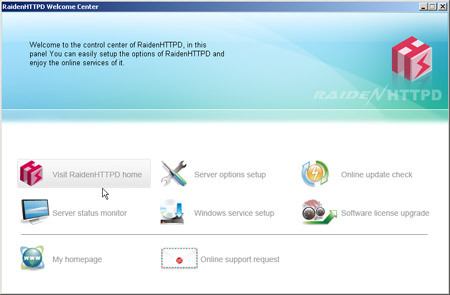 Now, you are all set as the RaidenHTTPD tray icon appear at lower-righthand corner of your windows desktop. Note that You can turn off apache 1.x 2.x and IIS services here, but it does not uninstall them for You, You will need to uninstall them if You decide to use RaidenHTTPD to replace them. If your service does not start successfully, it is probaby that there may be some service occupying your port 80. You may change the port for RaidenHTTPD to another one since we will primarily use SSL in the later tutorial. By double clicking the RaidenAdmin icon on the tray, You can launch the RaidenHTTPD welcome center. 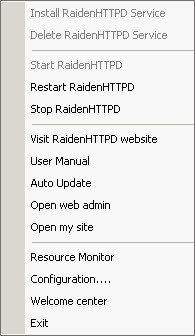 Right mouse click on the RaidenAdmin icon, You can open the RaidenAdmin popup menu.